Behold! The mighty Yeti! 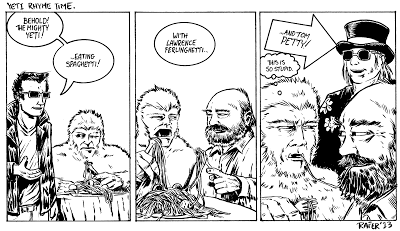 Teddy and the Yeti #4 boasted a new T&Y-themed comic strip from none other than Fred Hembeck, and for the fifth issue of the book, I thought I'd continue the nascent tradition and turned to friend and fellow FUBAR collaborator Rafer Roberts for an assist. 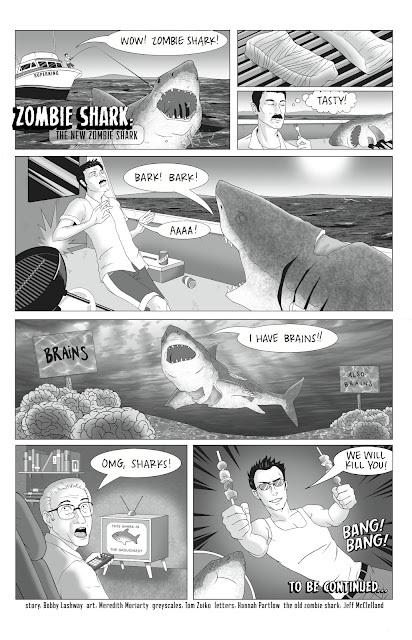 As you can see, Rafer came through with a great new comic strip that is just the right shade of bizarre for me. I especially like the fuzziness of the Yeti that we see here, along with one of the most obscure appearances of all time. That's poet and activist Lawrence Ferlinghetti, everyone! Get some culture, will ya? 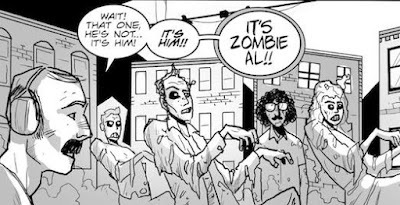 As I said, I'll be using this strip for the letters page of issue #5, and I'll get it colored so it fits in with the rest of the book in that regard. But here's an early look at it as I can't help but share when something this great shows up in my inbox. Rafer also recently sent me the newest issue of his book, Plastic Farm, and the above Thing sketch card, which is just so lovely. There are obvious Kirby influences but there's a uniqueness to it as well. It's a great combination. Be sure to check out more of Rafer Roberts's work by clicking the link to his website: http://plasticfarm.com! Be sure to check out his Thanos/Darkseid riff while you're there. New Gentle Giant Thing bust! For Christmas, I got a $50 Visa gift card. I was stunned to learn that you had to pay for these things - the card cost a total of $54.95 after the money was loaded onto it. I realize that Visa has to make something from selling these cards to make it worth their while, but wow! Next Christmas, let's split the difference and you can give me $52.50 in cash and we can both walk away a winner. Anyway, I used this $50 to buy something of great importance and didn't just blow it all on a frivolous purchase. That's right, I added to my Thing statue/bust collection with the recently released Gentle Giant Thing bust. I thought I'd show off a bunch of pictures of it here for all to see. This is, all around, a very spiffy item. There are plenty of good Thing statues out there, but there have been some subpar ones as well, and I'm happy to say that this is one of the nicer ones that I have. The proportions are right, the face looks good, and the Thing looks like he's ready to clobber, which I think is a prerequisite for any good Thing product. The box looks great, too. Sometimes I wonder just how many Thing collectors there are in the world. Statues aren't for everyone, and spending money on merchandise doesn't measure fandom, but for there to be only 400 of these statues in the world is surprising. The fact that I found one fairly easily, brand new and for less than the standard retail price is interesting. I'm glad, of course, that I can find things easily enough, but it does make me curious as to what the market size is for something like this, even more so when it comes to the huge 1:1 scale Sideshow busts that retail for $500 or more. I'm so glad they put him in blue shorts. I like the Future Foundation costumes well enough, but the classic blue is best in my opinion. This is a great addition to the collection. Below is a picture of some of my Thing stuff with this new statue included - not necessarily how I want it displayed right now, but it'll do until I make some (a lot ) of room. I've got a plan. I think. And oh, hey, look! There's a Rhinox statue in the mix. A worthy addition. The Hero Initiative does a lot of great things for comic book creators who have fallen on hard times. In recent years, the organization has produced limited edition, blank-covered printings of popular comics, mostly of Marvel books. Hero sends these books to various artists who draw on the covers, and Hero then sells the books to benefit their cause. It's a big fundraiser for the organization and it's always fun to see the different artwork that is produced for the event. This past year, Fantastic Four #600 got the Hero Initiative treatment, passing out copies to 100 artists, and recently, the books started to go up for auction. If ever I was going to get one of these special edition books, it'd have to be for the Fantastic Four. These books command a hefty price, but I fleeced my wallet and ended up a winner on one of the copies, and just a few days ago I got the package in the mail. 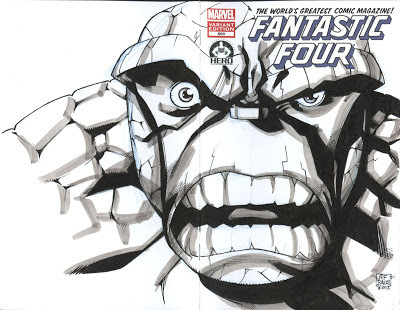 There are some really nice looking covers that were made for this event: you can view all of them here: http://www.heroinitiative.org/newsdetail.asp?n=312, and there's a collection of all the covers for sale, too, here: http://www.grahamcrackers.com/products/fantasic_four100_project_hc.htm. If you're so inclined, there are still some covers up for auction in the Hero Initiative's eBay store, and new covers are being added every Tuesday until they all sell. Included in the auction was the option to have the book sent to be graded and sealed in a case by the CGC. Since I didn't have to pay any more for it, I went ahead and had had it done. This is the first book I've had graded, and to be honest, I'm not the biggest fan of the CGC in most cases. Unless you've got a copy of Action Comics #1 lying around, it seems a bit like overkill with all of the other preservation materials available at many comic shops. People are grading and selling sealed copies of Amazing Spider-Man #700 on eBay as we speak, and for what? In two years, this is a book that you'll find on sale for two bucks at every comic convention in the world. But I suppose that it's a part of the comic book industry and there are different lengths that collectors are inevitably willing to go to. And I'd be lying if I said I wasn't thinking about sending a copy of the Tick Free Comic Book Day issue to CGC when it comes out, and that's a new book with a price tag of zero, a hem. This book got a 9.8 rating on a 10-point scale, which is about the equivalent of saying that the book is pretty much how God made it. I've never seen a book with a rating of higher than 9.8, and it's supposedly the "gold medal" of ratings as far as they're concerned. Peeking at the book through the clear plastic case, I can see that the top of the spine is a tiny bit frayed and one of the corners has a crease in it, which, since the book traveled from the printer to the Hero Initiative, to the artist, back to the Hero Initiative, to CGC and then to me is nothing unexpected, but it does make me think that just perhaps CGC saw that it was for a good cause, gave it a wink and a nod and then sent it on its way. In any case, I'm happy to have the book, which is certainly one of the rarest Fantastic Four issues ever printer - if not the rarest, period. The Hero Initiative does great work and, as far as I'm concerned, this was a win for everyone involved. Suffice it to say, FUBAR keeps surprising me with the amount of exposure it continues to gather. The book has been well received since the first volume and it's continuously done well at conventions. A few weeks ago, I was at a comic shop and someone approached me because he recognized me from a signing earlier in the year. He was excited to talk about FUBAR and I, honestly, was excited about someone recognizing me. There's a difference, though, with having a good convention and seeing the book included on the New York Times bestseller list, and recently, FUBAR got more of the high-profile attention that is a continued source of amazement. A few days ago, Kickstarter revealed a "best of 2012" presentation on their site, and front and center in this was a full slide dedicated to FUBAR and its NYT accomplishment. FUBAR was one of only a handful of projects that the site highlighted for the entire year-in-review show. That was quite the accolade, though it wasn't the only one to come our way. On January 9th, National Public Radio mentioned FUBAR in a piece about Kickstarter's accomplishments, and they were even kind enough to put a direct link to the FUBAR homepage on their website. The combination of these two events, I'm told from a reliable source, is already leading to increased website hits and a higher demand for the books themselves on sites like Amazon.com. What a great thing it is to be involved with a project like FUBAR - there was certainly a significant amount of luck in the mix on my end, as I was basically at the right place at the right time to jump on the creative wagon before the first volume came out - and it's been very gratifying to see it reach even the outskirts of the cultural zeitgeist the way it has. The FUBAR Winter Special, as it turns out, will be in stores on the last Wednesday of this month, followed by the third volume and several other smaller projects later in the year. Who knows where we'll be in another year. Maybe it'll go even higher. Perhaps one year, I'll ask for practical things for Christmas. A nice potato masher, for example. But not this year. Every year I show off some of the cool things that I got for Christmas to share the excitement with random people over the Internet, and this year is no different. So sit back and check out some of the stuff I got for Christmas! In the picture at top, there are actually two Thing toys, though one isn't as obvious. Larry (your friend and mine) got me '90s-era Marvel Universe Thing figure, denoted with a Roman numeral because he comes with his "disguise" outfit. On the right of the picture you can see a "Bonk Zonk" Thing toy, which is part of a large game that I have no interest in. Both of these are really cool! As you all should know by now, I love me some TV shows on DVD, and I did all right this year. I got the final two season of Star Trek: Voyager, which means that I now have every season of every Star Trek series (including the cartoon) ever created. Took me long enough! I also got "Freaks and Geeks", which I hear good things about. I hope it lives up to the hype. Hey, it's a new Wii game! My friend Caitlin from Alaska (that is her designation; if you had a friend from Alaska, you'd call that person something similar) got me this great Adventure Time figure! More DVDs: the latest volume of Futurama and the second volume of Space Ghost: Coast to Coast! Remember when I predicted that the Steelers would win the Super Bowl this year? Boy did I have that wrong. I'm not quite sure what happened to produce an 8-8 season, but I still love the black and gold, and I got a few neat Steeler items for Christmas. First on the slate is the Hines Ward Dark Knight Rises figure, which is soooooooo awesome. I also picked up the new Steelers DVD, highlighting the impenetrable defense of the 1970s. I can finally start reading the League of Extraordinary Gentlemen thanks to these two trades! This gift was completely frivolous - more so than most of my other ones, even, but it holds a special place in my heart to be sure. It's a neon light-enhanced Pac Man sign! This one is Inky, if I remember correctly. Since I've got my Ms. Pac Man arcade game set up at Evil Genius Comics in California, PA, I took this there and asked the folks there if they'd be willing to hang it up and display itin one of their windows. They agreed! And it's got a prime location in the window. If you look at the bottom right of the picture, you can even see the Ms. Pac Man cabinet. Hooray! This item was actually bought for my wife, but it's too cool not to show off here on the blog. It's a Star Trek Enterprise pizza cutter! The saucer section is, of course, the cutter, and it looks ten times as awesome in real life. It comes in its own case and everything! It's almost too cool to actually use it...almost. I bought this display piece for my wife, so it's not technically mine, but again...too cool to leave out, if I say so. This is a metal-plated replica of the gun Mal Reynolds uses on Firefly! It's got a nice heft to it and it comes with its own stand. Even the box is great. This beauty came from Quantum Mechanix, which makes tons of sci-fi collectibles, most of which I want to own. Lastly, here's another item that's not mine, but it's something I thought really turned out well. One of my nephews is a big fan of Jeff Smith's Bone from reading the Scholastic reprints, so my wife crocheted Fone Bone for him! Needless to say, it was a big hit - she even made one of Bartleby as well! That's a bunch of what I got for Christmas in 2012. Great times, and thanks to everyone for the gifts. 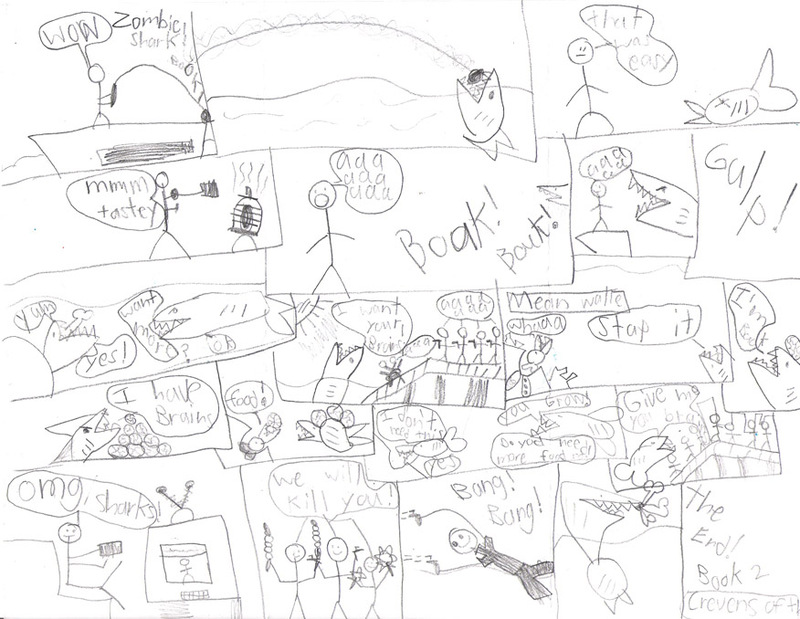 A few months ago, I shared a hand-drawn comic that I got from my seven-year-old nephew titled "Zombie Shark". For Christmas, and with a lot of help from some talented comic folk, I was able to recreate his idea into a one page story that you see above. In all, I think that it turned out rather well, and I'm a bit miffed that a story like this could come from a kid in elementary school and not, well...me. Whatever. Above is the completed story, free to Internet read and to print out and stick on the inside of your locker. 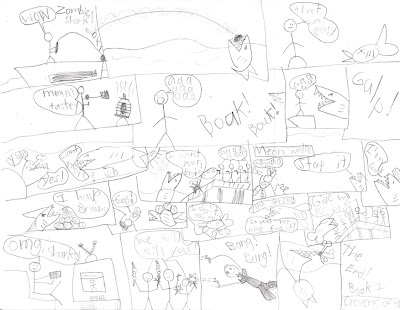 I'll put a copy of this up on the "webcomics" section of the blog. A holiday tradition! My students continue to draw the Hulk poorly. At this point, we should know how this game works. As an aside on the final I give in the composition classes I teach, I hint at the possibility of bonus points for renditions of the Hulk in/on the green books used for a final essay. I never actually give out bonus points for this, but it's fun to see just who takes the bait and draws up a Hulk. Not too many to choose from this time around, but then again, if you've seen one terribly drawn Hulk, I guess you've seen them all. Please keep in mind that these are college students who are drawing these; I can't say that I would do a good job at drawing, well, anything, if given the chance, but some of these are just awful beyond any hope of redemption. Case in point: the image at top is perhaps the best one I received. THIS image, however, is probably the worse...EVER. I actually like this one, although it may pass better for a Sea Monkey or some similar quasi-aquatic animal. I do enjoy the Hulk speech employed here. What? This isn't the Hulk. It's a picture of me, wearing a shirt with my own name on it and a Pirate hat. Come on. This is how you draw the Hulk if you can't draw. I can appreciate this one and it's probably no better or worse than my own art would be. This artist started to draw something, but had to erase it and start over...and still, this is the best he/she could do. The Hulk pants are nice, though.